2BR, 3BA 1314 Sq. Foot Townhome With Beach Views. Sleeps 8. Free WiFi. Looking for a great family getaway? Sea La Vie is your answer! FULL REMODEL as of Feb 2019! Spacious interior, 2 large decks overlooking the ocean, and everything you need to make your family getaway comfortable and easy. Master Bedroom has a king memory foam bed, newly remodeled en-suite bathroom with over-sized walk in shower, plus 40' Smart TV & great ocean views. 2nd bedroom has queen bed, plus bunk beds to accommodate 4, also with an en-suite bathroom and 32' & DVD player TV for the kids. Both bedrooms have beach/ocean views and open up to an outdoor deck. Upstairs, there is a queen sofa bed. The third bath is located upstairs with full tub and shower. 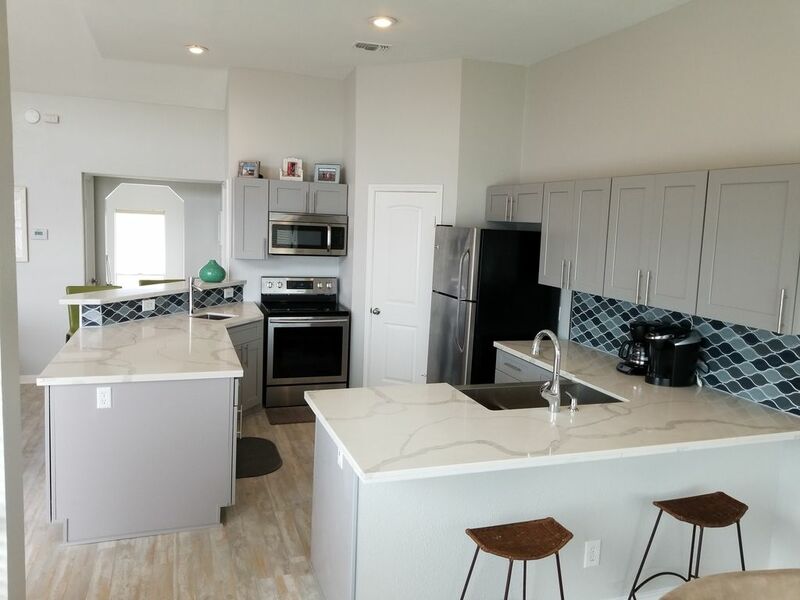 Fully remodeled in Feb 2019 Kitchen is stocked for all your needs. There is an indoor dining room, plus a deck with outdoor furniture to enjoy the sound of the surf with your cocktails! Large living room with 55" smart TV, and free wireless internet. On the lower level, relax on the hammock while enjoying the ocean views and make sure to check out the fully stocked storage unit with beach chairs, beach umbrella, floats, boogie board, skim boards and a gas grill--all for your convenience! (-If available, we will always do our best to replenish these items, if we are made aware that they are broken). There is an outdoor shower on the lower level to use when you come up from the beach. Beach is a 2 minute walk from the townhome, plus, a great restaurant and fully stocked grocery store are only a minute's walk...forget your bacon at breakfast? Grocery opens at 7:30am! The community is located on the West End of Galveston and surrounded by private homes, and a wonderful, wide, private beach--no cars allowed on this beach--and you won't have to get up early to stake your claim on the sand--this beach is wide open and uncrowded. Minutes to Moody Gardens and just a short drive to the action of the seawall, downtown Galveston & much more! We are a family of 3 living in Austin and just love Galveston! It is our "happy place" and we love sharing our ocean getaway. Views, views, views, plus the sound of crashing waves right from the deck. Can't beat it! Great Views from both bedrooms and 2 spacious decks. Parking for 4 cars--2 covered. Free fast Wifi! Bring your computer to stream movies on one of the 3 flat screens. limited beach towels are also provided for your convenience. blender, George Foreman grill, utensils, glassware+++ Fully stocked Big ocean views from kitchen!-If available, we will always do our best to replenish these items. seats 6-8, plus extra seating at counter & bar. 55' Smart TV in Living Room, 40' Smart TV in Master & 32' TV +DVD player in 2nd bedroom. Is usually in bottom draw of second bed room & can be plugged into any TV. Games, puzzles and beach toys. large green space for kids to play soccer or games! 2 decks overlooking the beach and ocean. Lower level patio with picnic table and ocean views. Close by, not included with rental. We enjoyed the accommodations. Most was clean and new. Would recommend to family and friends. Love the location, there was almost nobody on the beach! The owner was very quick to respond any questions I had! It was a great relaxing trip! We rented this house for 7 of us 3 adults and 4 teenage boys. House was great! Beach access was close and house was in a residential area so very quiet. If there are other times or combinations of days that you are interested in, please contact us directly and we will work with you.